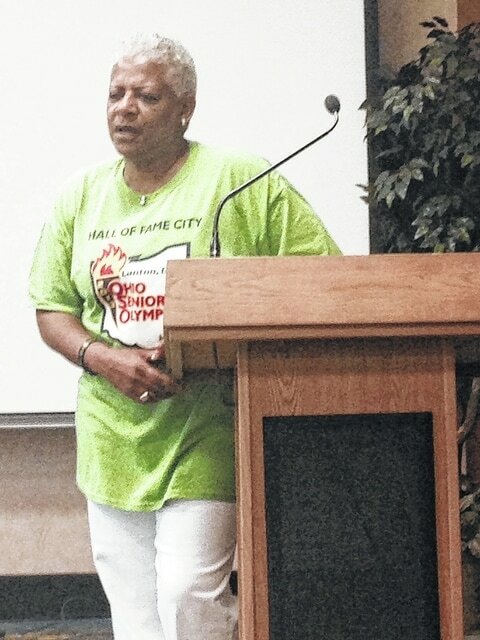 Portia Williams | Daily Times Lyvette Mosely, coordinator for the Ohio Senior Olympics, hosted an information about the upcoming event at Hill View Retirement Center on Tuesday. Promoting healthy lifestyles for seniors through education, fitness and sports,’ is the theme of the Ohio Senior Olympics. Local coordinator for the Ohio Senior Olympics, Lyvette Mosley, spoke to a group at Hill View Retirement Center on Tuesday. Mosley said the reality of hosting an Ohio Senior Olympics is slowly, but surely coming into fruition. “We are anticipating a great move from the community. Everyone that I have talked to is very excited about the Senior Olympics coming to Southern Ohio. Everyone that I’ve talked to wants to be involved, and that is what has impacted me, and let’s me know that I am doing the right thing, and that my labor is not in vain,” Mosley said. The Senior Olympics games will include 3 on 3 basketball, archery, bowling, golf, table tennis, track and field events, such as discus, triple long jump, shot put, high jump, pole vault, running long jump, and race walk.Other activities include horseshoes, corn hole, pickle ball, swimming, and volleyball. They are anticipating 2016 for the Ohio Senior Olympics to come to Porsmouth. She said she will continue to travel throughout southern Ohio, and talk to a host of organizations, businesses, and churches to spread the word about the upcoming Ohio Senior Olympics. She said they will soon have a Facebook page for the event as well. For more information regarding the Ohio Senior Olympics, contact Lyvette Mosley, or Libby Brisker, RSVP Scioto County Coordinator at 740-353-8810.